Veterans and military families – welcome to Navarro College! Navarro began offering classes in September 1946. Most members of the first student body were returning Veterans from World War II looking to take advantage of assistance available under the newly enacted GI Bill of Rights. We continue to proudly serve Veteran students to this day. Navarro College is committed to helping you succeed as you transition from military to college life. HOW TO BECOME A STUDENT. STEP-BY-STEP. In Texas, a student enrolling in an institution of higher education, must have lived in Texas the one year (12 months) proceeding the first date of enrollment to be classified a Texas resident for tuition purpose. If you have attended school or resided out-of-state, additional proof of residency may be required, and the Office of Admissions and Records reserves the right to determine the validity of documents submitted. Use the College Credit for Heroes website to request an evaluation of military educational experience that may count toward your college degree. If you are an incoming freshman, you must meet with an academic advisor (listed on your Degree Plan, which is available in WebAdvisor) before you can register for classes. Transfer or returning students in good standing are encouraged to visit with an academic advisor (listed on your Degree Plan, which is available in WebAdvisor) before choosing classes. However, students in good standing may register. Fill out VA Form 22-1990 (if you have never used VA Education benefits before) or VA Form 22-1995 (if you have used VA Education benefits at another school and now wish to transfer the benefit to Navarro College). These are available through the Veterans Online Application System, VONAPP or through e-Benefits. Follow the instructions to log in (you may need to create a username and password first) and select the appropriate form when given that option. Submit a copy of your DD214 or NOBE (Notice of Basic Eligibility) to your VA Certifying Official. Submit your Certificate of Eligibility to the Navarro College Certifying Official. This is the letter from the VA that verifies your eligibility for VA Education Benefits. If you have misplaced your Certificate of Eligibility, you may access this document on e-Benefits if you qualify for a premium account, or you may Submit an Inquiry to the VA requesting this document (you may need to create a username and password first). All Hazlewood Applications must be turned in with the appropriate documentation. Partial applications cannot be accepted. Contact your advisor and select the courses you want to take. VA benefits cannot be used for classes that you have already taken and passed with a letter grade of A, B, C, or D; unless, you are in your last semester before graduation. If you are taking developmental (or remedial) courses, you must take on-campus courses. Your VA benefits will not pay for online developmental courses. VA benefits will not pay for Physical Education courses for Veterans on A.A. or A.S. Degree Programs, unless you are pursuing a Kinesiology Degree, but credit for those courses can be gained by turning in an eligible DD214 to the Office of Admissions. Complete the Request for Certification Form online. The Request for Certification alerts the Navarro College Certifying Official that the student has registered and their schedule is finalized. 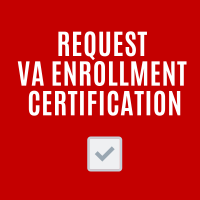 Upon receipt of the request, the Certifying Official will evaluate the student’s schedule and submit all eligible classes to the VA for certification, thus ensuring that the VA begins payment for the semester at the appropriate time. The Request of Certification should be completed after your class schedule is finalized, but before classes begin, if at all possible. Requests will be processed in the order in which they are received. Students can pay for classes at the Cashier’s Office or pay Navarro College tuition in full or in installments online with e-Cashier. If you have Chapter 1606, 1607, 30 (without the Hazlewood Exemption), or 35 (without the Hazlewood Exemption), you will not receive any VA funding until the end of the first month of enrollment. Therefore, you MUST have financial aid or establish a payment plan with Navarro College to pay for classes before the payment deadline; otherwise, you will be dropped from your courses due to non-payment. If you have Chapter 33 (Post-9/11 GI Bill), please ensure that you have turned in your Certificate of Eligibility and completed your Request for Certification at least 10 business days before the payment deadline so that you are not dropped from your courses for non-payment. These students will have a “Do not Drop” hold placed onto their student account to ensure the student is not dropped due to non-payment while Navarro College awaits payment of tuition and fees from the VA.
On Campus: All students must bring their class schedule and student ID to the Bookstore. This will aid the Bookstore in pulling the correct books for you. Don’t forget to bring any scholarship/sponsorship paperwork when you buy your books. Get ready to attend class.